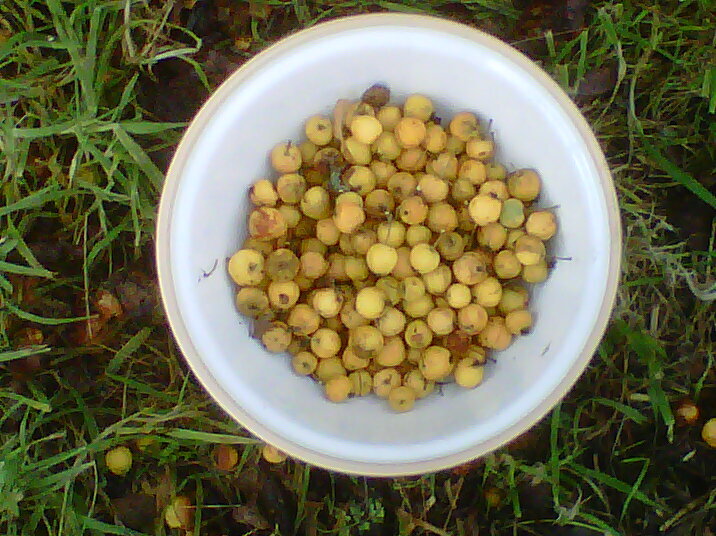 Back in the orchard again today. 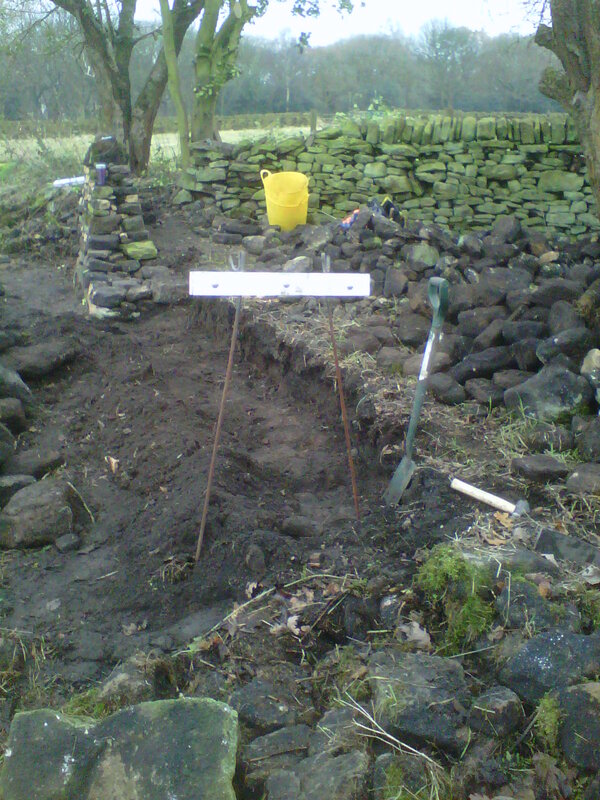 The top photograph shows the part of the wall that I built last weekend – probably only a metre or so. Today, I turned my attention to building this wall out. Rather than just concentrating on one small section, I have dug out the foundations for the next 4 metre section. It took about 3 hours to dismantle the existing wall and dig the foundations. 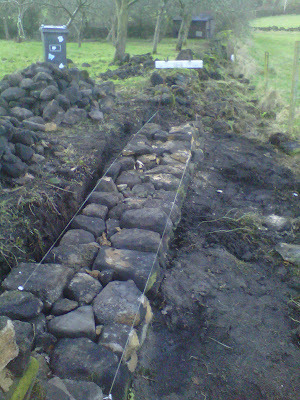 It took another hour to lay the foundation stones. 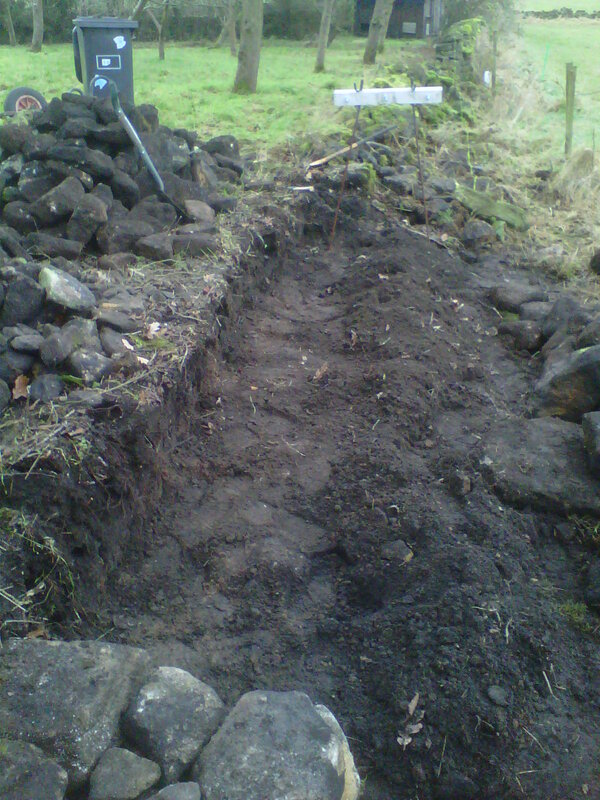 By concentrating on digging out the foundations, this will help speed up the building of the wall and also gets the foundations dug before the winter frost sets in and the ground freezes (making it difficult, if not impossible, to dig the foundations). One of the key things with the budgeting is trying to get it as accurate as possible. There are always going to be unknowns, so there is always going to be the need for some contingency. However, if you can reduce the unknowns to the minimum, this is going to reduce the likelihood of any surprises. So looking at the current estimates, there are a number of big unknowns…..
Will it need to be replaced? What condition are the roof trusses in? We have looked in the loft (of No. 8 only) and the roof looks to be in fairly reasonable condition. The roof trusses are nothing special (very plain), but the perlings look good. Not sure that there is a lot of merit in opening up the roof space. The cost of refurbing the existing roof is estimated at around £14,000, so not a huge sum relatively. Are there any foundations in the barn or has it been built directly onto the earth below. We have no idea on this until work states. In the budget, we have assumed the worst and included the costs of completely rebuilding the walls (to include foundations). This was installed in the 1970’s. It is an 800 gallon tank, so is plenty big enough, but what state is it in? Also the design is fairly dated and the water simply soaks away into the bottom field. The top seems pretty rotten, but it is clearly still operational. We need to get a specialist in to provide some advice. If the septic tank could last a couple of more years, it could be replaced at a later date. Specialist help needed. These are fairly “springy” in places and certainly do undulate. Pulling back the carpets revealed some very poorly laid tongue and groove chipboard. The underlying joists appear to be ok. New floors required and included in estimates. Originally, the office space was going to be above the double garage that has now been removed from the plans due to costs. 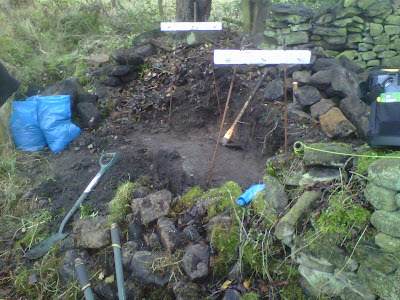 The current plan is to build some office space into the existing coal hole. The space is odd and quirky. The walls are singled skinned (but original) and the floor is made up of flagstones. There is some modern block work inside. Some of this appears to be helping structurally. Mark (the architect) to provide a quote. We collected about 4 large sacks of apples from the orchard a couple of weeks ago. 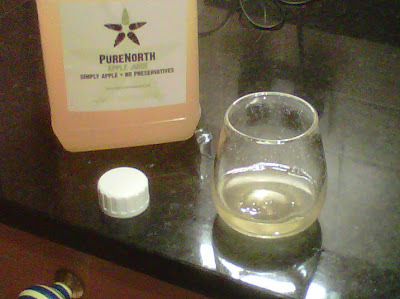 Rob North pressed the apples to use the juice for cider, but he dropped off a litre of apple juice yesterday afternoon. It actually tastes remarkably alright – the apples were a little to sharp too eat, but the juice is very drinkable. Even though we have only just started the process we seem to be generating a lot of paperwork. Plans, photographs, brochures and bills. We decided to keep a large A4 diary since the start of the project and that has worked quite well until now. However, we are starting to struggle to keep on top of all the paperwork, particularly since we took ownership (and now have a set of utility bills to pay. Times two!). So it was time to invest in a filing cabinet. A simple, cheap two drawer filing cabinet. Top drawer is for all the material that relates to the design of the renovation. The bottom drawer is for all the information that relates to the running of the property – utility bills, council tax, etc. It feels much better to have everything tucked away in the right place. Day six and time for a new location. 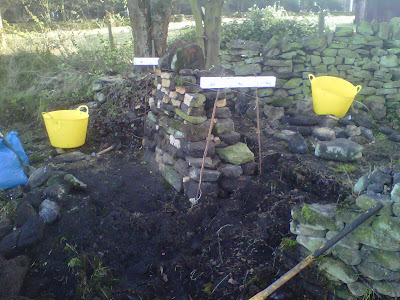 Having had some success with my initial attempts at dry stone walling, I have now turned to a location that is a lot more visible and will be seen by visitors to the house. At least I know it will look half decent when finished! The wall being rebuilt is the one to the left of the top photograph. It is in pretty poor shape and has collapsed into the adjoining field. The first job is to strip out all the existing stones and dig new foundations. 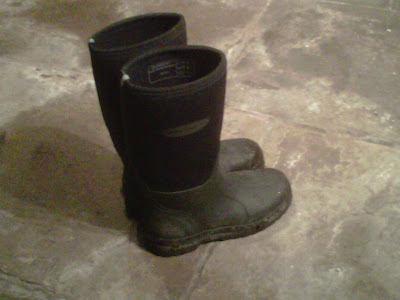 The fields are at slightly different levels – the adjoining field is around 18 inches lower than on my side. There is a wire fence on the other side of the wall, but there is a 3 feet between the wall and the fence making it possible to work on that side without having to take the fence down. Once the stones are removed, I have stacked them according to their size. 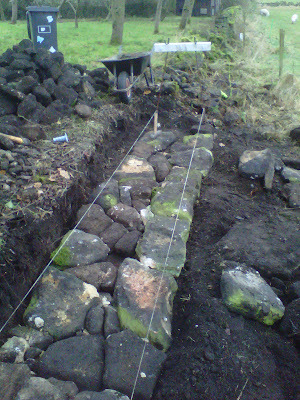 I put coping stones (the ones that go on top of the wall) to one side, then stack the others with the face of the stone facing upwards. 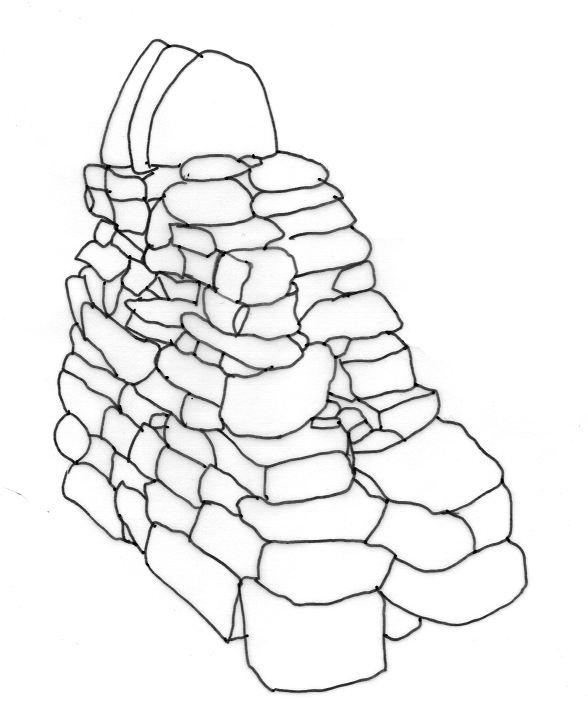 Smaller stones next to the coping stones and then the larger ones stacked closer to the wall – this means that I don’t have to carry the bigger stones as far. 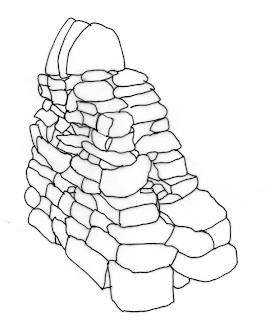 By stacking the stones with their faces up, it means that selecting stones when rebuilding the wall becomes that much quicker. The stacks of stones starting to grow – the coping stones are stacked furthest away from the wall as they go on last.